Spooky Booth 100% scary faces! Freakify your face with the help of this seriously Spooky Booth! Snap a pic, or grab a photo straight from your camera roll, and add loads of gruesome graphics to turn yourself, your friends or your family into hilarious horrors! And you can save or share your very own Frankensteins via Facebook, Twitter or email, making send you can send shivers down your friends’ spines. - A design so simple to use that even a Zombie could master it! 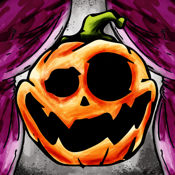 - Tonnes of seriously spooky stickers to tap, rotate and resize any way you want! - Seamless social media integration, letting you fire your freaks across the world. With enough flexibility to make millions of monstrosities, Spooky Booth is guaranteed to bring you hours of horrible fun! Thanks for all the great feedback and reviews! If you have any further thoughts, drop us an email to info@bluepandaapps.com!